Next Friday, on the 20th of January, the Standard Chartered Dubai Marathon will take place. The Arab Emirates 42.195km race has attracted the attention of all the long-distance fans in the past few days. 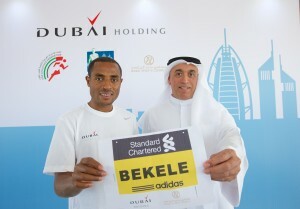 In fact, the presence of the Olympic athlete Kenesisa Bekele had already been announced long time ago; but in the Emirates, you can go big or you can go home. Therefore, only one week before the competition, a maxi bonus worth 250.000 USD was put on the line for those who will be able to establish a new WR, in addition to the 200.000 dollars awarded to the winner of the race. “We want a nice race” Peter Conerton, the organizer of the competition, said – “in which paces in line with the World Record are set from the very beginning: it is a way to incentivate the athletes“. Bekele, in 2016, was capable of running the Berlin 42.195km in 2h03’03, not far from the Dennis Kimetto’s WR of 2h02’57. In addition, we will also see two more competitors, both of them accredited by a sub 2h05 time: Dino Kemal and Sisay Lemma. The competition among them will surely stimulate Bekele to try and grab that WR, which is closer and closer to 2 hours. They will also be supported in the process by three experienced runners: Edwin Kiprop, Amos Kipruto and Endeshaw Negesse. For what regards the Women competition, it will be almost an Ethiopian festival, with 15 of the 18 announced top runners coming from the country of the highlands. None of them ever got below 2h20 and the best PB belongs to Shure Demise with 2h20’59, two seconds better than Meselech Melmaku’s one. In addition to the big prize money, the track could also help the athletes in their attack to the Record: Dubai’s track is historically a very fast one, where times below 2h05 for Men and below 2h20 were consistently achieved in the past. The competition will take place at 6.30, local time. You can watch the competition live using the streaming here below.